As part of TalesofThings we are tagging the city, putting memories and history onto the streets and allow people to leave their own thoughts and experiences via the free TalesofThings qrcode and iPhone app. One of our favorite parts of London was around Camden Town and the Bansky Maid stencil which is now sadly long gone due to the short sighted view of the council. However, before it was painted over we captured a 360 x 180 panorama of the site, allowing you to travel back in time and see how the wall looked. The tag is now stuck to the wall, simply go up to Chalk Farm, scan the tag and see how the wall used to look, complete with a Banksy. 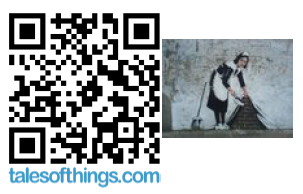 You can also scan the tag direct from the image above using the free iPhone TalesofThings app.